I drafted this back in the Fall, when The Hobbit was first hitting the theaters but neglected to post it. 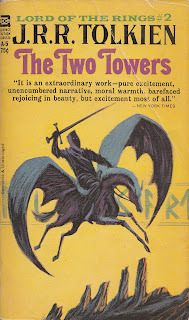 So belatedly, the Book of the Week is The Two Towers by J.R.R. Tolkien, the second in the legendary Lord of the Rings trilogy. This is the 1965 Ace Books "pirated" edition, the first American paperback, with cover art by Jack Gaughan. I previously covered the story of Ace's unauthorized edition of Lord of the Rings, and you certainly don't need me to tell you who this fellow Tolkien was. So let's use this space to discuss another aspect of the Lord of the Rings intellectual property rights, unrelated to the dispute with Ace Books. I confess I've never watched the animated Lord of the Rings films, so I was not aware of this oddity until researching the Ace editions for this blog. It seems that when Ralph Bakshi was creating the 1978 animated version, the studio persuaded him to adapt the three books into two films. (That's not as odd as it sounds, since Tolkien himself never conceived of the story as a trilogy.) So for the first film, confusingly released (over Bakshi's objection) under the title The Lord of the Rings, the studio only acquired the film rights to The Fellowship of the Ring and The Two Towers. That left the door open, when Bakshi ended up not making the second film, for Jules Bass and Arthur Rankin Jr. (who did the previous animated version of The Hobbit) to make the 1980 animated edition of The Return of the King. The trouble is, they only had rights to the third book, so most of what occurs in the second half of The Two Towers, including the defeat of Saruman and what happens in Shelob's lair, is omitted from any of the animated films. Thankfully, Peter Jackson came along and made the whole issue moot. Our first semifinal in Bracket Five of the Fantastic Reviews Battle of the Books features Railsea by China Miéville going against Harmony by Keith Brooke. The book I (Aaron) most want to continue reading after 100 pages will reach the championship round. Railsea: Del Rey hardcover, May 2012, 424 pages, cover art by Mike Bryan. Railsea reached the Final Four by defeating The Express Diaries by Nick Marsh in the first round and Ghost Key by Trish J. MacGregor in the second round. Railsea takes place in a bizarre world where trains travel rails criss-crossing a deserted tundra to hunt moldywarpes, moles that grow to incredibly vast sizes. The molehunters' homes are on "islands" somehow constructed above the railsea. People live in mortal fear of the earth, and indeed, the one time our young protagonist Sham actually touches the ground he is immediately attacked by vicious mole rats. Sham's train is commanded by a female Captain Ahab, whose "philosophy" hinges on finding the moldywarpe that took her arm. (It turns out that in this world, every train captain has lost a limb and is obsessed with the land creature that claimed it.) Sham and the captain find a photograph of a strange place where only a single line of rail crosses the land, but the captain does not share Sham's fascination. Harmony: Solaris paperback, June 2012, 413 pages, cover art by Adam Tredowski. 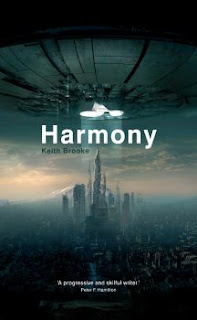 Harmony (published in the UK under the title alt.human) reached the Final Four by defeating Wildcatter by Dave Duncan in the first round and The Croning by Laird Barron in the second round. In Harmony, the Earth has long been occupied by multiple races of aliens, who have herded humans into "Ipps," Indigenous Peoples' Preserves. Our teenaged hero Dodge scratches out a living in the Craigside Ipp, which is visited by refugees from another town, Angiere, where aliens recently slaughtered nearly all the humans. Dodge also rescues a strange woman who lacks the "pids," personal identifiers, aliens have placed in all humans' bloodstreams. Tellingly, her name is Hope. A single chapter from Hope's point of view tells us she was in Angiere just before its destruction, which likely was no coincidence. Meanwhile, Dodge learns that a group of aliens is trying to help the humans, while others would prefer simply to wipe us all out. The Battle: My guiding criterion in the Battle of the Books is not which book is better but which book do I most want to keep reading. Usually those are the same——I'd rather keep reading the book I think is better——but not always. Case in point: if you ask me which, Railsea or Harmony, strikes me as a better book after 100 pages, I will hem and haw and sincerely tell you they are both very good, but in the end I will say Railsea is probably the better of the two. 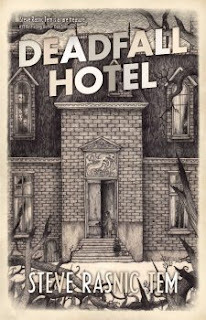 Both books are very much about cognitive dissonance, creating a sense of strangeness, and nobody but nobody does weird better than China Miéville. 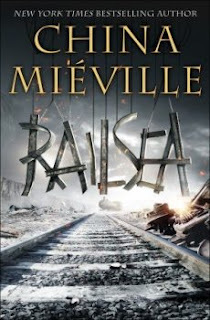 The railsea is a striking construct, and his multi-layered world is wonderfully memorable. But Harmony also contains plenty of interestingly strange elements, for instance the way humans have learned to convey immediate emotional responses through alien clicks instead of facial expressions. And I'm more attached to Harmony's key characters, Dodge and Hope; the only character developed so far in Railsea is Sham, and he doesn't much grab me so far. There is a terrific scene at the end of the first 100 pages of Harmony where the aliens carry off the leaders of Dodge's community, then an alien asks the remaining people who is their leader now, and Dodge is startled to realize they are all looking at him. This tells me much about his personality, and it suddenly makes those around him his people in a deeper sense, which makes me care more about what happens to them all. This in turn makes me care about where the story is headed. I want to know whether Dodge can navigate the strange alien politics he has been caught up in, and whether he and Hope and Dodge's people can survive, and perhaps even find their way to a freer life. In contrast, in Railsea, it doesn't matter to me very much whether Sham finds the place with only one railway line, or whether the captain tracks down her great white moldywarpe. But wait! some of you cry. If Harmony has stronger characters and a more compelling storyline, doesn't that mean it was really the better book all along? Hmm, I answer. You could be right. If so, then what you're telling me is the Battle of the Books format is the best way to test how good a book really is. What an intriguing suggestion! Harmony advances to the championship round, where it will face either Nightglass by Liane Merciel or The Testament of Jessie Lamb by Jane Rogers. We hope you've enjoyed this tournament so far. This sixteen-book bracket, our fifth, contained books from across the genre. There were science fiction, contemporary fantasy, high fantasy, historical fantasy, and horror books. Hopefully some sparked your interest. I know there are books that I (Amy) would like to read. Now only four books remain. Stopping reading good books after only 25 or 50 pages can be difficult, and so can judging between two completely different books, but this format allows us to sample and spread the word about many more new books and authors than we otherwise could. Three of the four "seeded" books made it to the Final Four: Railsea, Harmony, and The Testament of Jessie Lamb. The dark horse of this group is Nightglass, which is a tie-in to the Pathfinder role-playing game. 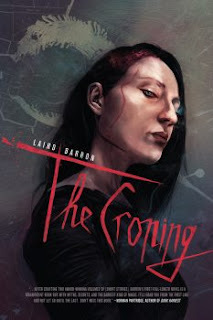 The second round of Bracket Five of the Fantastic Reviews Battle of the Books pits Harmony by Keith Brooke against The Croning by Laird Barron. The winner will be the book I (Aaron) most want to continue reading after 50 pages. 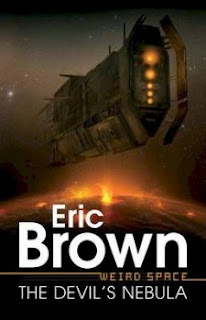 Harmony: Solaris paperback, June 2012, 413 pages, cover art by Adam Tredowski. Harmony (published in the UK under the title alt.human) got here by defeating Wildcatter by Dave Duncan in the first round. Harmony takes place long after the occupation of Earth by multiple varieties of aliens. Humans live in "Ipps," Indigenous Peoples' Preserves. In the first 25 pages, our teenaged hero Dodge saved a young woman who, inexplicably, lacked any "pids," the personal identifiers the aliens have placed in all humans' bloodstreams. In the second 25 pages, he learns that a human community in another region has been entirely wiped out for unknown reasons. Sol, the leader of Dodge's Ipp, sends him to a nearby Ipp in hopes of joining forces to prepare for the possibility of another such attack. While there, Dodge spots the woman he previously rescued. The Croning: Night Shade hardcover, May 2012, 245 pages, cover art by Cody Tilson. The Croning reached the second round with a win over Fated by Alyson Noël. The Croning began with a dark reimagining of the Rumpelstiltskin story, then took us to 1958, where an American man named Don frantically searches Mexico City for Michelle, his lost wife. In the second 25 pages, Don's search ends badly but not quite fatally. Don does not understand his strange occult experiences in Mexico City, and it seems Michelle knows something she is not telling him. We then get a brief glimpse of federal agents investigating a shooting in 1980, before flashing ahead to the present day, as octogenarian Don takes Michelle for a romantic getaway to celebrate their sixtieth anniversary. The Battle: I hope the Battle of the Books is successfully conveying to all of you how many excellent writers we have today doing interesting work in the science fiction, fantasy, and horror genre. For once again, here is a battle which forces me to choose between two very well-written and engaging novels. Both novels have done a nice job of pulling me in by placing their characters in grave danger from the outset. As I mentioned in his previous battle, Keith Brooke has a marvelous knack for conveying strangeness. The bizarre scenery of Harmony's occupied Earth makes for a fascinating setting. Dodge takes it for granted, for instance, that the aliens use scent to manipulate humans, and that humans have added alien clicks to their language to express emotions. Every page introduces an interesting nuance to Dodge's strange life in the future. The first pages of The Croning depicted a similarly strange world of the past, or at least the past of an odd and frightening fairy tale. The next chapters bring us into the Twentieth and Twenty-first Centuries, but with effective hints of something unfathomable lurking in the shadows. I'm enjoying both these books and would be happy to continue with either. Forced to make a choice, it comes down to the characters. I liked the brooding "Spy" of the first chapter of The Croning, but I believe we're done with him. Now that we've switched to the present, I am not so attached to Don and Michelle. Don strikes me as a bit of a twit, and pretty much all I know so far about Michelle is that she has kept an important secret from her husband for over fifty years, which doesn't make her too sympathetic. Her lips pressed against mine, firm and cool, over in an instant. I flinched, surprised, and clicked, "!¡fear ǀ excitement¡!" I reached for her but she had turned, stepped away, and almost before I could react she was pausing at the entrance to the villa, dipping her head to me in parting, and then she was gone. I could taste her on my lips still. I could close my eyes and feel the pressure of her mouth on mine. I care about what happens to Dodge, and I want to see more of Brooke's future world. Harmony advances to the semifinals, where it will face Railsea by China Miéville. The final first round match of Bracket Five of the Battle of the Books features The Testament of Jessie Lamb by Jane Rogers going against This Case Is Gonna Kill Me by Phillipa Bornikova (aka Melinda M. Snodgrass). The winner will be the book I (Aaron) most want to continue reading after 25 pages. 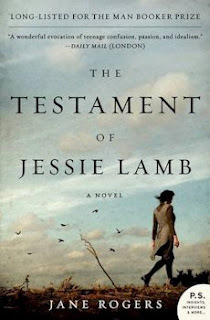 The Testament of Jessie Lamb: Harper Perennial trade paperback, May 2012, 240 pages, cover photo by Clayton Bastiani. Jane Rogers is the author of eight generally well-received mainstream novels. The Testament of Jessie Lamb is her first try at science fiction. It was originally published in England in 2011 to a very favorable reception, including being longlisted for the Man Booker Prize and winning the Arthur C. Clarke Award. The Testament of Jessie Lamb is set in a near-future world in which it has become impossible for women to have children. (Please don't say Rogers borrowed the idea from The Children of Men by P.D. James, because the premise was used well before that, notably by Brian Aldiss in Greybeard.) Teenager Jessie Lamb writes this memoir from the locked room in which she has been imprisoned, apparently by her father. She recounts the general panic and unrest when Maternal Death Syndrome, or MDS, first spread through society. MDS is a virus created by bio-terrorists, which has infested everyone. Triggered by pregnancy, it is fatal within a few days to any woman who becomes pregnant. But the threat of death is not sufficient to keep the boys and girls in Jessie's circle of friends from desiring each other. 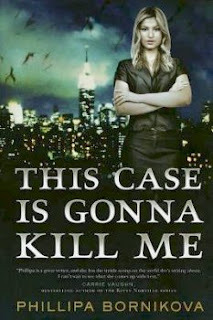 This Case Is Gonna Kill Me: Tor trade paperback, September 2012, 318 pages, cover photo by Veer & Getty Images. Phillipa Bornikova is the urban fantasy alter ego of Melinda M. Snodgrass, the author of seven original SF/F novels, as well as a Star Trek tie-in and extensive work in George R.R. Martin's Wild Cards universe. Snodgrass also wrote several romances in the 80's under the name Melinda McKenzie. Her background as a fellow lawyer is easy to spot in much of her work, notably her Circuit/Circuit Breaker/Final Circuit lawyers-in-space trilogy, all of which were nominated for the Prometheus Award. 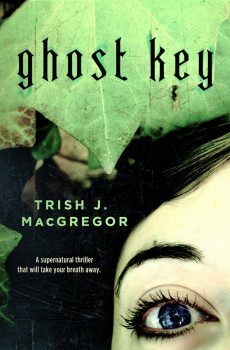 Her most recent books under the Snodgrass name were The Edge of Reason (2008) and The Edge of Ruin (2010). Snodgrass also wrote several episodes of Star Trek: The Next Generation and was story editor for the show's second and third seasons. This Case Is Gonna Kill Me is urban fantasy slash legal thriller. Our protagonist Linnet Ellery, fresh out of Yale Law School, has just started work at a prestigious New York "White-Fang" law firm. In this society, vampires hold most positions of authority. In particular, all of the senior partners at the firm are vampires, and the male associates are vying to be made partners and also made vampires. But in this world, vampires only bite men; so as a woman, even if Linnet manages to become a partner, it will only be for one mortal lifetime. In the first 25 pages, Linnet is shunned by her fellow new associates and stuck in a drab assignment, assisting with a stale probate case. She gradually comes to realize that she is a pawn in a political contest between two of the senior partners. The Battle: I am happy to say this is a battle between two excellent women authors who have created two strong, albeit inexperienced, female protagonists. But during that evening, before I started feeling ill, when we were all madly dancing and making the world spin around us, I had this fantastic sense of freedom. I thought I could be free of my Mum and Dad and their petty squabbles. I could soar. No one could say a thing to me, especially not anyone older than me. Because it was them who had messed things up. The beginning of This Case Is Gonna Kill Me is also nicely done, but I'm sorry to say that, as much as I admire Melinda Snodgrass as a writer, I'm not her ideal reader for this one. I often have a hard time engaging with urban fantasies, and this one is a particularly hard sell for me because the opening section strongly emphasizes the legal side of the story rather than the urban fantasy. Through 25 pages, nothing fantastic has happened at all. I mean, Linnet is told all the senior partners at her firm are vampires, but hell, they told me the same thing when I started work as a lawyer. So far, the thrust of the story is big law firm politics, which I've experienced far too much of in the past twenty years (albeit not in a snooty Manhattan firm) to enjoy. I feel badly for not giving Snodgrass more of a fair shake here, but then there is little shame in dropping a battle to a Clarke Award-winning novel with a very strong opening. The Testament of Jessie Lamb moves into the second round, where it will face A Guile of Dragons by James Enge. The penultimate match in the first round of Bracket Five of the Fantastic Reviews Battle of the Books pits City of the Fallen Sky by Tim Pratt against A Guile of Dragons by James Enge. The winner will be the book I (Aaron) most want to continue reading after 25 pages. City of the Fallen Sky: Paizo paperback, June 2012, 353 pages, cover art by J.P. Targete. Tim Pratt is the author of The Strange Adventures of Rangergirl and Briarpatch, as well as two collections, three media tie-ins, seven urban fantasies as by T.A. Pratt, and one novel under the name T. Aaron Payton. Pratt won a Hugo Award for his story "Impossible Dreams" and has been nominated for the Nebula and World Fantasy Awards, among many other honors. City of the Fallen Sky is a Pathfinder role-playing game tie-in. 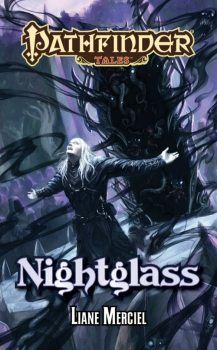 (Another Pathfinder book, Nightglass by Liane Merciel, has already advanced to the second round in this bracket.) Our protagonist is Alaeron, an unscrupulous scholar in possession of magical artifacts he has stolen from Technic League. In the opening scene of City of the Fallen Sky, Alaeron uses one of those artifacts to rescue a beautiful woman named Jaya from two menacing thugs. But Alaeron soon will be menaced himself, both by an agent of the Technic League and the rich employer of the two thugs, and he may need Jaya to come to his rescue. A Guile of Dragons: Pyr trade paperback, August 2012, 264 pages, cover art by Steve Stone. James Enge is the author of the Morlock Ambrosius trilogy, beginning with Blood of Ambrose, which was nominated for the World Fantasy Award. Enge also teaches at Bowling Green, under a funny name. A Guile of Dragons is the first in a prequel series, showing the early days of Enge's character Morlock Ambrosius. In the opening chapters, Nimue Viviana discovers she is pregnant by her lover Merlin. Fearing that Merlin will cast her aside, Nimue is persuaded by Earno Dragonkiller to betray Merlin. Earno transports Nimue across the Sea of Worlds, and she and her unborn child are transformed by the voyage. The Battle: This battle matches up two excellent fantasists. Enge is going back to the origins of his signature universe. Pratt is working in the Pathfinder RPG universe, and the two previous Pathfinder books in the Battle of the Books were both impressive. 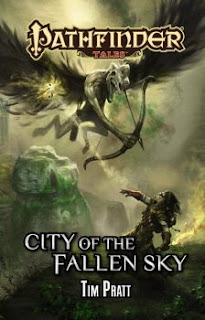 The opening of City of the Fallen Sky is also nicely written, but it lacks the engaging characterization of the other Pathfinder books I've sampled. Through 25 pages, I don't have a good sense of the character Alaeron. Hopefully as the book proceeds, he will develop enough personality to carry a novel, but the Battle of the Books can be unforgiving of characters who need time to grow on you. A Guile of Dragons opens with a very clever short chapter explaining how our hero Ambrosius earned the enmity of the universe's competing Two Powers: "They both hated Ambrosius. He would suffer for inspiring them to agree on anything." From there, we flash back to before his birth, when his mother Nimue faced some agonizing decisions. Even if readers believe she was wrong to betray Merlin, her reasons are understandable, and we can still sympathize with her. 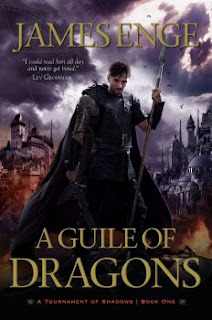 Although I have not read Enge's previous books, the opening section of A Guile of Dragons is most engaging, definitely leaving me wanting to read more. A Guile of Dragons advances to the second round, to meet either The Testament of Jessie Lamb by Jane Rogers or This Case Is Gonna Kill Me by Phillipa Bornikova.